By Brandon EcoffeyWounded Knee, the site of one of the most horrific and tragic events in all of American history, is being offered up for sale by its owner. The family of James A. Czywczynski, owners of two 40 acre sites of land where the slaughter of approximately 300 Lakota men, women, and children took place on Dec 29, 1890 has agreed to sell the land for $3.9 million. “It is time for our family to sell the land. We would really like to see the land returned to the Lakota people and that is why I am giving them an opportunity to purchase the land before I open it up to others for sale,” said Czywczynski. “I could offer it up for public auction like the Runnels did with Pe’ Sla, but I would prefer that the Lakota people be the ones to purchase it,” he added.And:The site does not include the mass gravesite where the members of the United States 7th Cavalry piled the bodies of those who were murdered that day. However, the parcels of land do include the immediate surrounding area where the massacre took place and the area surrounding Porcupine Butte (the site of KILI radio is not included). It does include the site of the original Wounded Knee Trading Post. The Czywczynski family has owned the property since 1968, when they purchased the property from the Gildersleeves who had owned the property prior. During the 1973 occupation of Wounded Knee by the American Indian Movement, Mr. Czywczynski had his home, all of his personal belongings, the trading post he owned (including all of the artifacts inside), and several vehicles destroyed. At the time he and his family were returning from a high school basketball game and were told by the United States Marshall Service that he could not return to their home that night. By Daniel Simmons-RitchieElected tribal officials said the Oglala Sioux Tribe is interested in purchasing what is considered sacred ground to the tribe but not at a price that far exceeds its actual value. "I think the tribe should take all necessary action to purchase the land but at a reasonable price. I understand it's a historic site but that shouldn't be a means to take the tribe for a huge amount,” said Garfield Steele, who represents the Wounded Knee District on the tribal council. Kevin Yellow Bird Steele, who also represents Wounded Knee, said the property is inflated to the point of insult and is an attempted exploitation of a dark chapter in U.S. history. "As a representative of Wounded Knee District, I'm totally appalled," he said. According to Shannon County records, the property has an appraised value of $7,000. Czywczynski, however, cites a second event that brought national attention to Wounded Knee when explaining his asking price for a piece of property in a rural outpost on the reservation. Comment: It's kind of ridiculous to ask $3.9 million for land worth $7,000. It's a shame Czywczynski lost so much, but he should sue the people responsible. Why should anyone pay millions of dollars to make up for pain and suffering they didn't cause? For more on Wounded Knee, see Fire Totals Wounded Knee Museum and Pine Ridge Needs Tourism. The site of the 1890 Wounded Knee Massacre which had been put up for sale by land owner Jim Czywczynski a little more than a month ago now has a potential buyer. Birdnecklace Renewable Energy, LLC of Sioux Falls informed Native Sun News in that they are making a public offer to buy the land from Czywczynski. BRE stated that it is the company’s intention to purchase the land. In response to a counter offer from Jim Czywczynski, Birdnecklace LLC has withdrawn their original offer to purchase the Wounded Knee land site citing violations of the Native American Graves and Repatriation act. As internal haggling over the price of Wounded Knee developed Native Sun News has learned that negotiations between the two parties have now broken down. After reviewing the proposal from Birdnecklace LLC which offered 10% of the $4.9 million upon closing of the deal, Jim Czywczynski owner of the land presented a counter offer asking for 20% down and a willingness to close the deal this past week. Dahmen the first Native supermodel? Gun nuts fear "race war"
Indians named for first thing they see? 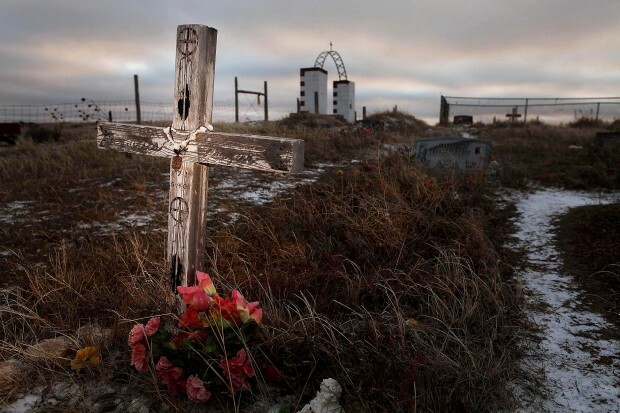 Wounded Knee seller "should be ashamed"
Are Southern death camps plausible?